Hailee Steinfeld got the shock of her life while on the set of Bumblebee. 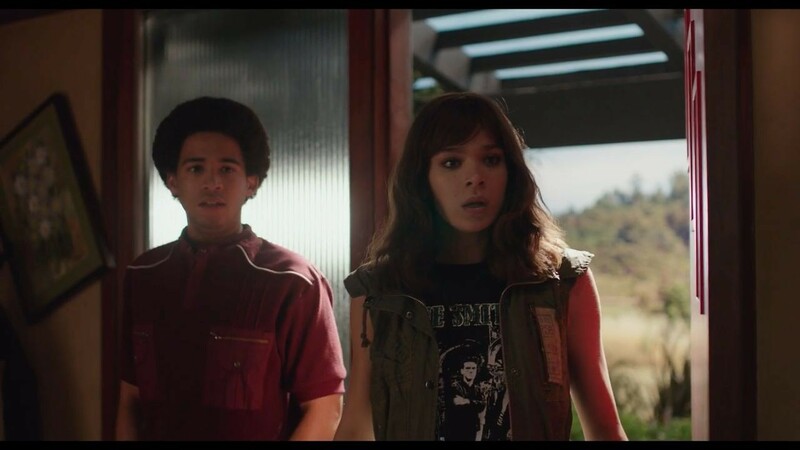 In a PEOPLE exclusive deleted scene from the film, Steinfeld’s character Charlie and her friend Memo (Jorge Lendeborg Jr.) dodge and outsmart everyday kitchen appliances that have come to life to wreak havoc on her home. For fans of the film, the scene takes place after the beloved Transformer, Bumblebee, is left to his own devices while home alone in Charlie’s house. After trial and error at learning how to use some of the kitchen appliances, he inadvertently brings things such as the refrigerator, the dishwasher and the washing machine to life — only for them to take on evil personas. “Bumblebee, what have you done? I told you to stay in the garage,” Charlie says, only to be attacked by her family’s fridge. The film debuted in theaters in December and raked in an impressive $459 million at the world box office. Also starring John Cena, Bumblebee was directed by Travis Knight, who previously directed Kubo and the Two Strings and written by Christina Hodson, who wrote the scripts for Unforgettable and is currently working on Margot Robbie’s Harley Quinn spinoff Birds of Prey. Bumblebee is available on Digital, 4K Ultra HD, Blu-Ray and DVD. Sony certainly had a hell of a year last year with their two Marvel films, Venom and Spider-Man: Into the Spider-Verse. One blew the doors off the box office and one took home an Oscar for Best Animated Film. So, as it stands, the studio is hard at work developing follow-up movies for both of these properties, and in the case of Spider-Verse, there are multiple projects in the works, which makes sense given its multiverse aspects. The two projects in the works are a Spider-Women spin-off that will follow Gwen Stacy, Jessica Drew (aka Spider-Woman), and Cindy Moon (aka Silk), who are three characters who have taken on spider abilities in Marvel’s rich history. The other is a direct sequel to the original that will follow Miles Morales’ story, and whose journey will reunite him with Gwen. On that note with the latter film, Discussing Film is reporting that stars Shameik Moore (Miles) and Hailee Steinfeld (Gwen) have signed on to reprise their roles. There is no word yet if Steinfeld has signed on for the spin-off, though the report makes it sound like the sequel is the only film she has officially signed on for. Are you excited to hear that they may have locked down two key talents for the sequel? Granted, they still have to, you know, come up with an idea, a script, and everything else that comes with making a movie. Let us know down below! Several weeks ago, news broke that Drax Project’s “Woke Up Late” would be impacting pop radio on February 5. At the time, the news omitted a rather important detail: the promotional push will not concentrate on the original version. Rather, it will be a remix of the song featuring Hailee Steinfeld. In a blast being issued to radio programmers (and set to cover this week’s Mediabase pop radio chart), 300 Entertainment confirms that the new version of the song will be released to radio at 12PM ET on January 21. It will then, as noted, officially impact on February 5. Hailee Steinfeld is open to making more Bumblebee movies. The Oscar-nominated actress portrays Charlie Watson, a teenage girl who finds and befriends a Transformer named Bumblebee, in the new flick – the sixth instalment of the live-action Transformers franchise. Bumblebee has won praise for the 1980s setting and Steinfeld’s performance, and she has now indicated that she would be open to exploring her character further in a sequel. Bumblebee was released in late December (18) and has so far been a success, garnering $97 million in the U.S. and $192 million at the global box office. Previously, director Travis Knight stated that he would be interested in making more films if “the world wants more”, while Steinfeld’s co-star John Cena, who portrays former U.S. Army Ranger Jack Burns, has also indicated that he would want to appear in another flick. “I really enjoyed working with Travis, but I love the movie and it looks like it’s going to make a lot of money too, so hopefully we’ll be able to do it again,” he said. But if a new Bumblebee film did get the go-ahead it may be some time in the future, as Steinfeld has a number of projects on the go, including TV series Dickinson, which looks into the life and work of American writer Emily Dickinson. Critics have been hailing “Bumblebee” as the best Transformers movie and they point out Hailee Steinfeld’s emotionally resonant performance as one of the big reasons why it works. “There was quite a bit that I found I could relate to with this character. I love first of all how driven and passionate she is just about life in general, what she loves about the people around her. I definitely think we share that,” said the Filipino-American actress in an interview with ABS-CBN News. “It wasn’t until I got the idea of performing is what was of interest to me. I didn’t necessarily know what that meant until I really got into it. I guess I have my parents, my family for supporting me fully,” she added. Steinfeld, whose grandfather is Filipino, has played many memorable characters but there’s something close to home that she hasn’t done yet. “I have not [come across a story where there’s a Filipino character] but if I did, I absolutely would love to. It’s something I am very proud of. I’ve been only once, I have to go again. To this day, going to the Philippines, one of the most memorable experiences I’ve ever had in my career, so I would love to go back. So yeah, if there was ever a part, I would love to play it,” she said. The movie also stars Angela Bassett as the voice of the villain Shatter while Dylan O’Brien voices Bumblebee. It’s now out in US cinemas and will be shown in the Philippines starting January 8. Hailee Steinfeld wants nothing but positivity in 2019. The Oscar nominee made headlines on Wednesday, January 2, when she shared a cryptic message about relationships on her Instagram Stories — not long after her split from Niall Horan. Some fans were quick to speculate on social media that the actress’ posts may have been about Horan, 25, but she was quick to shoot down the rumors. Steinfeld and the former One Direction singer, who never publicly addressed their romance, were first linked in early 2018 after being spotted together at London’s West End production of Hamilton. Over the months that followed, they continued to get cozy and packed on the PDA while out and about in Los Angeles. When Hailee Steinfeld took to the stage at the MTV Music awards 2018 last month, it was natural placement for the 22-year-old. The actress, songstress and host for the night commandeered the stage with an unmistakable demeanour — the kind of striking presence embodied only by great showmen. As Steinfeld’s mini dress, entirely encrusted in glitter caught the light — and along with it, the audience’s attention — her ineffable personality shone brighter, engaging viewers in her every word. On the same night, she returned onstage to perform her single “Back to life”. The earworm, which features in the soundtrack of what also happens to be the latest of her filmography: hollywood blockbuster “Bumblebee” — a spin-off of the “Transformers” series. Every bit a seasoned performer, Steinfeld enthralled the crowd as she manoeuvered the sprawling stage all while nailing dance choreography without missing a beat. Every move in her performance is a reminder of her immaculate talent, equally impactful when stripped down from a showy production to an unadulterated silver screen role. At just 22 years old, the Los Angeles native counts more than a decade of experience in the entertainment business. Her accolades, too, go way beyond her years. “I watched ‘Paper Moon’ when I was eight and started acting shortly after. My parents felt it was important for me to study so they challenged me to commit to classes for a year. We made a deal that if I was still passionate about acting at the end of the year, we could explore getting an agent,” says Steinfeld in an e-mail interview with T Singapore. The fire in her belly burnt stronger with time. When Steinfeld was 14 years old, she became an Oscar-nominated actress for her role in Amercian revisionist film “True Grit” (2010), later earned herself a Golden Globe award nomination for the coming-of-age classic, “The Edge of Seventeen” (2016), and along the way established herself as an identifiable figure in tinseltown through her role in the widely popular installments of “Pitch Perfect” amongst other films. And why not? She was about to celebrate her 22nd birthday. The animated “Spider-Man: Into the Spider-Verse,” in which she’d voiced Gwen Stacy, had just been nominated for a Golden Globe. Best of all, she’d spent the week bouncing between Berlin, London and Los Angeles, where she lives, to promote “Bumblebee,” the latest “Transformers” installment. And the word on the street was glowing. “Bumblebee” is not one of Michael Bay’s “Transformers” (although he’s a producer). Directed by Travis Knight, this Bumblebee origin story steps back to 1987, where the stouthearted, blue-eyed Autobot has been hiding from the evil Decepticons as a yellow 1967 Volkswagen Beetle in a California beach town. And Steinfeld, the franchise’s first female lead, is not a typical “Transformers” babe. As Charlie — lonely, on the edge of 18 and grieving her dead father while tinkering on his 1959 Corvette — her body isn’t the eye candy of yore. Instead of cleavage and abs, Charlie flaunts her biceps and quads in punk rock T-shirts and ripped jeans, a symbol of strength, independence and self-reliance as she screeches along highways and puts up a fight. In fact, the only ones removing their tops in “Bumblebee” are the guys. She’s also a pop star in the making who showed off her voice in the second and third “Pitch Perfect” installments and last summer opened in Britain, Barcelona and Lisbon for Katy Perry on “Witness: The Tour.” In a phone interview from Los Angeles, Steinfeld spoke about sliding into the Transformer’s seat, her long-awaited album and discovering her own voice. You’re turning 22 in a couple of days. Any big plans? Actress Hailee Steinfeld is rumored to return for a female-centric spinoff to the animated Spider-Verse film, leading the next film alongside characters like Jessica Drew’s Spider-Woman and Silk. When asked about the possible spinoff movie, Steinfeld expressed excitement at the future of the Spider-Verse. Hailee also revealed she was blown away by her animated character’s appearance.